A brand-new health breakthrough out of Alberta, Canada, shows that keeping a diet high in salt can deplete calcium levels in the body. This raises the risk of kidney stones, osteoporosis, and bone fractures. When sodium leaves the body, it takes calcium with it. This new study helps explain why people on high-salt diets are prone to such issues as kidney stones and osteoporosis. It found an important link between the two common minerals. Both calcium and sodium are regulated by the same molecule. So when salt levels rise, the body gets rid of some in urine — and that takes calcium along for the ride. Calcium in the urine can lead to kidney stones, while of course low levels in the body can weaken bones. 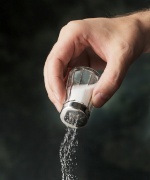 This is significant because we’re getting more and more salt in our diets. That means our bodies are shedding more and more calcium. This reinforces why it is important to have a low-sodium diet and to have lower sodium levels in processed foods. Because it isn’t just the salt you shake on when you’re about to eat; the much greater culprit is the invisible salt in so much food. We’ve known the molecule in question was linked to sodium absorption. But this discovery shows that it also plays a role in regulating calcium levels. The researchers worked with lab models without this important molecule, so the models’ urine contained high levels of calcium. Because calcium was not absorbed and retained by the body, bones became thin. Perhaps to underscore the point, the main funder of this study was the Kidney Foundation of Canada. Data shows that one in 10 adults will pass a kidney stone at least once. The prevalence seems to be rising, and may be linked as well to obesity and diabetes rates. About 60% of adults get far more than the maximum daily recommendation for sodium. Its most famous link is spiking blood pressure. Lots of salt puts pressures on kidneys, causing extra fluid in the body that keeps your circulatory volume higher than it should be. The result: pressure on the walls of your arteries. You should also be aware that, when you are eating out, you are likely to get an “extra” dose of salt in your meals. Salt is used to stimulate your appetite.